The Honda Passport nameplate has made its return after a long hiatus. The all-new midsize SUV is designed for adventure-seekers. It offers generous passenger and cargo space for a two-row SUV. It also has a potent engine. It slots between Honda’s compact CR-V and the larger, three-row Pilot. In fact, some say the Passport looks like a shrunken Pilot. But, the new Passport does have a more rugged look than its larger sibling, as well as more ground clearance. The Passport is based on Honda’s reinforced unibody midsize light-truck platform, featuring a fully-boxed floor structure. A sophisticated fully independent suspension system also helps the Passport have solid on- and off-road driving performance. Honda says the Passport is the most rugged of its light trucks yet. It also has a potent engine and can accelerate quickly. The Honda Passport is offered in four trims: the base Sport, upgraded EX-L, high-tech Touring, and the fully equipped Elite. The base Honda Passport Sport model has a starting price of $31,990. The highest level Elite trim, meanwhile, starts at $43,680. That’s a little bit cheaper than rivals’ high-end trims. Every Honda Passport is powered by a 3.5-liter V6 engine that churns out 280 horsepower and 262 lb.-ft. of torque. The engine is paired to a newly refined 9-speed automatic transmission. The SUV offers brisk acceleration and has a towing capacity of up to 5,000 pounds with the available towing package and all-wheel drive. Speaking of all-wheel drive, Passports with it benefit from Honda’s exclusive i-VTM4 torque-vectoring system. It helps the Passport perform better off-road than some of its competition. There’s also the four-mode Intelligent Traction Management system that works in conjunction with I-VTM4 on all-wheel drive models, allowing the driver to customize the system to better fit a variety of terrains, including sand, snow, mud, and normal streets. Some critics, however, have pointed out that without hill descent control, skid plates, or locking differentials, the Honda Passport is not a true off-roader. But, it is still capable of light trail exploration and offers 8.1 inches of ground clearance. If you have a boat or camping trailer to tow, the Passport is more than capable of doing so. The Passport’s standard Multi-Angle Rearview Camera also helps make connecting to a trailer a breeze. It provides a bird’s eye view of the hitch and trailer. As for gas mileage, the Passport ranks average. It gets an estimated 20 miles per gallon in the city and 25 mpg on the highway. For all-wheel drive models, subtract 1 mpg from each figure. While those estimates are on par with most midsize SUVs, there are certainly other midsize SUVs out there that will save you more money at the pump. Moving inside the vehicle now, the Honda Passport offers plenty of room for five passengers. Even if you’re tall, you won’t feel cramped in this two-row SUV. You’ll find durable fabric for the interior in the base trim, while higher trims offer perforated leather and other perks like heated front and rear seats, and a heated steering wheel. As for cargo space, the Passport offers 41.2 cubic feet behind the rear seats. 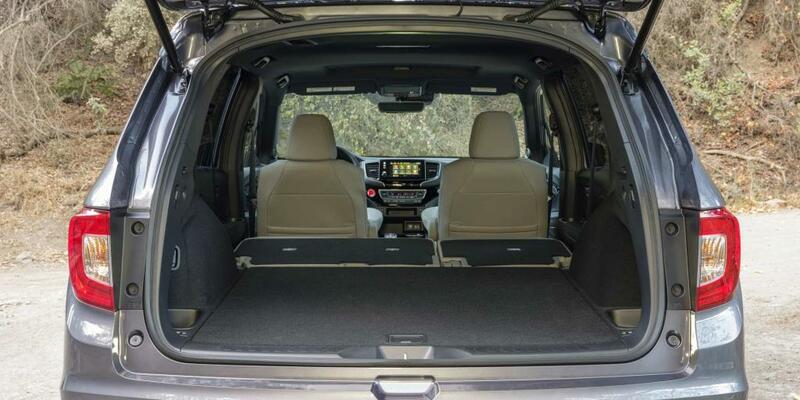 Those rear seatbacks fold flat, however, for a total of up to 77.9 cu.-ft. of space. That’s more than enough space to fit a bicycle or plenty of camping gear and luggage. There’s also an additional 2.5 cubic feet of storage space beneath the floor. That underfloor storage is near the rear bumper and can be easily accessed by lifting the rearmost section of the floor. Unlike some of its competition, the Passport does not make you choose between underfloor storage or a spare tire. The SUV’s smart packaging incorporates both. And while the Passport does offer decent cargo space, we should note there are other midsize SUVs on the market that offer even more. For other small stuff, there’s plenty of storage space throughout the cabin. For example, there’s a large center console bin between the front seats that has a rolling cover that can be used as a tray when closed. Additional storage can be also found elsewhere in the vehicle. As for the technology inside the vehicle, the base Passport Sport features a relatively small 5-inch infotainment screen and a standard seven speaker sound system including a subwoofer linked to a USB port. A second USB port is for charging only. Bluetooth, meanwhile, comes standard on all Passports. You can upgrade to an 8-inch touchscreen if desired. If lets you swipe, tap, and pinch like you would on a tablet or smartphone in order to control the vehicle’s audio system and other features. You can also opt for a larger, 10 speaker audio system with subwoofer if the 7 speaker system isn’t enough. Other available interior upgrades include a navigation system, Wi-Fi hotspot, wireless phone charging, two more USB ports, satellite radio, HD radio, and Apple CarPlay and Android Auto compatibility. The Passport’s exterior definitely has a more rugged feel than some of Honda’s other SUVs. The black grille, bumper, and black wheels (on Sport and Elite trims) convey off-road prowess. However, there’s nothing incredibly spectacular about the Passport’s look. The Passport shares much of its body and chassis engineering with the Honda Pilot and Ridgeline. Some say they feel the Passport looks too much like the Pilot. However, the Passport has an increased ride height of about one inch over its sibling. It’s also six inches shorter overall, while sharing the same wheelbase. The wider track helps provide better handling around town and the wider wheels provide increased grip. As for safety, the Honda Sensing suite of advanced safety and driver-assist technologies comes standard on all Passports. That system includes Forward Collision Warning, a Collision Mitigation Braking System, Lane Departure Warning, and much more. All Passport models also come equipped with that Multi-Angle Rearview Camera we mentioned earlier, while Passport EX-L trims and higher get additional blind spot information. Every Passport also includes automatic high beams. To help mitigate the severity of a frontal collision and occupant injuries, the Honda Passport also uses the latest generation of Honda’s Advanced Compatibility Engineering body structure, which works in concert with a new “3-bone” floor frame assembly and hot-stamped steel door rings. Honda also designed the Passport with the awful reality of pedestrian collisions in mind. Many car manufacturers are trying to help prevent those collisions altogether through autonomous technology. The Passport, meanwhile, features a hood that deforms if contact is made with either an adult or child pedestrian. Sufficient clearance exists between the hood and hard engine parts, allowing the hood to deform if impacted. There are also energy-absorbing fender mounts and supports, and a windshield base with a unique section structure for efficient impact energy absorption. Honda’s research shows that those kinds of features can dramatically improve a pedestrian’s chance of survival if struck by a moving vehicle. The new Passport was designed to achieve high scores and superb performance in all National Highway Traffic Safety Administration and Insurance Institute for Highway Safety crash tests. 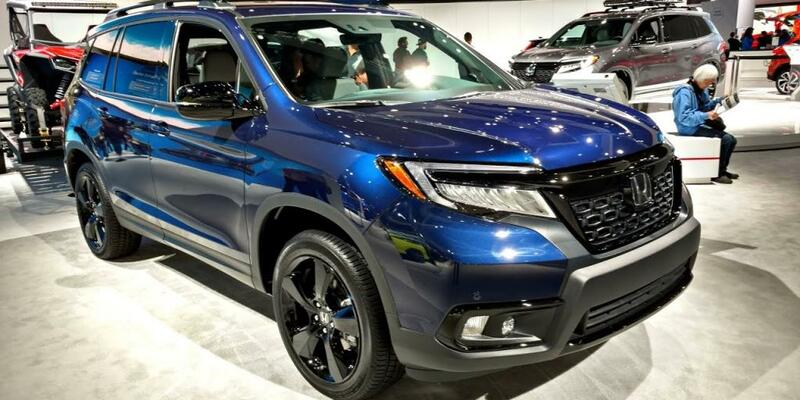 The 2019 Honda Passport enters a crowded and competitive segment. Its rivals include the Toyota 4Runner, Jeep Grand Cherokee, Ford Edge, Nissan Murano, and others. 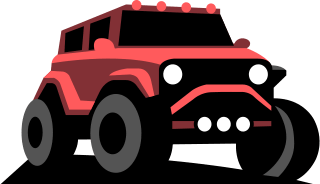 While it is capable of light trail exploration and does handle better on pavement than others in its segment, potential customers need to weigh exactly what it is they want to get most out of an SUV before making any purchase decisions. It’s always important to also test drive any vehicle you’re interested in. 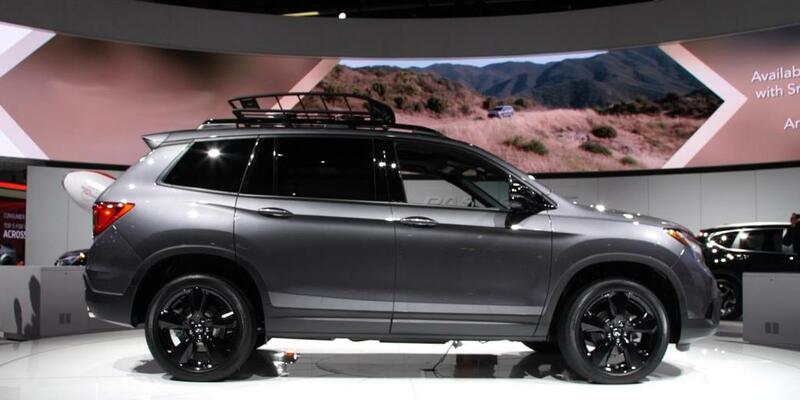 If you’re looking for a two-row SUV that offers plenty of passenger and cargo room, handles well on- and off-road, and comes with a number of standard safety features, the Honda Passport just may be for you! It’s a well-rounded vehicle that aims to provide the on-road comfort you get in a Ford Edge, but also some of the off-road prowess of a Jeep Grand Cherokee. While this SUV is no Jeep and certainly lands more on the comfort end of the spectrum, it’s still well-rounded and a great option for a two-row SUV. Honda resurrected the Passport name from the 90s, and it seems they’ve done the new vehicle a solid!